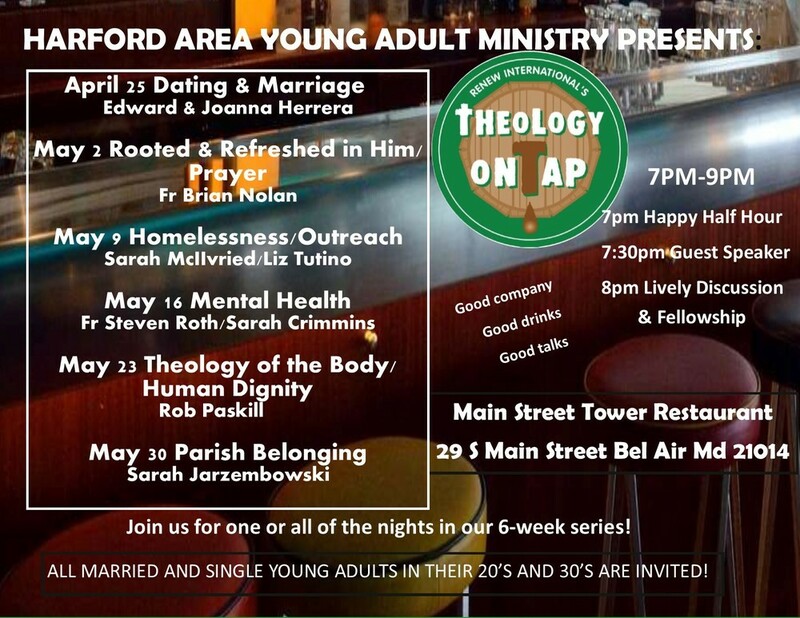 Young Adult Ministry Contact Info: Kellie Reynolds kreynolds@archbalt.org (best) or 410-592-7294. Service & Social Justice Committee: Are you interested in Catholic Social Teaching and how that teaching can inform current events of our community and world? If you would like to serve on this parish committee that meets once a quarter as well as assist with our many parish service projects, please contact Kellie Reynolds 410-592-7294 or (best) kreynolds@archbalt.org. Moms’ Ministry: New to the parish? …the area?... a new mom? ..or just looking for a new way to connect with other moms? Please join us! For more information contact Liz Pippin greenpup83@hotmail.com or, see the ad in this newsletter for details on dates and meeting locations.